It’s no secret that I have my own strong opinions on the quality of chocolate to be found in Florida, and I don’t withhold my scathing judgement on the bizarre aftertaste that Hershey’s chocolate leaves on my tongue, however all is not lost America, I have found your redeemer (bizarrely enough the redeemer is made by none other than Hershey’s themse lves). Reese’s Peanut Butter Cups. Those four simple words hold the power to send a shiver down my spine. Unless you have tried them and love them, I can’t communicate to you how incredibly delicious I find these little chocolate covered peanut butter filled morsels. They are indescribably addictive and all the more surprising for being the product of my arch nemesis (in life it’s always healthy to have an arch nemesis, even if they’re unaware of your position on things. I myself enjoy the thrill of having 3 arch nemeses including a small collective of munchkins in The Mothership’s Hamlet with whom I engage in snowball warfare each winter; a young child in the UK, highly intelligent, with whom I engage in vicious yet parent-friendly verbal banter, and now Hershey’s who, for the most part, produce chocolate that tastes like (to me at least) ear wax). Why they are so addictive I have no idea. Maybe it’s because chocolate and nuts, albeit peanut butter, may be one of the best culinary combinations in the history of mankind; maybe it’s because they’re loaded up with sugar and give us a rush that we continuously seek; maybe it’s because they sneak addictive enzymes into their recipe…who knows! The chocolate itself is, for me, nondescript, and nothing more than the right accompaniment to compliment the main star of the sweet treat, which is after all the peanut butter core. The peanut butter itself is bizarre and like no other peanut butter I’ve ever had. I doubt you can buy the same textured PB in a jar anywhere, as it’s clearly the brainchild of those dark geniuses at Hershey’s. The peanut butter interior is fascinating as it has a light flavour that isn’t too sweet or sickly, and is easily chewed and thankfully doesn’t stick to your teeth unlike caramel or nougat. There is also a perplexing gritty texture to the pe anut butter that is oddly wonderful. Looking at a number of recipe sites, a huge amount of people have attempted to replicate the Hershey’s creation and make their own peanut butter cups, and almost all suggest that to get that wonderful gritty texture you should finely process Graham Crackers into crumbs, and mix in with your peanut butter paste before coating in your chocolate of choice. 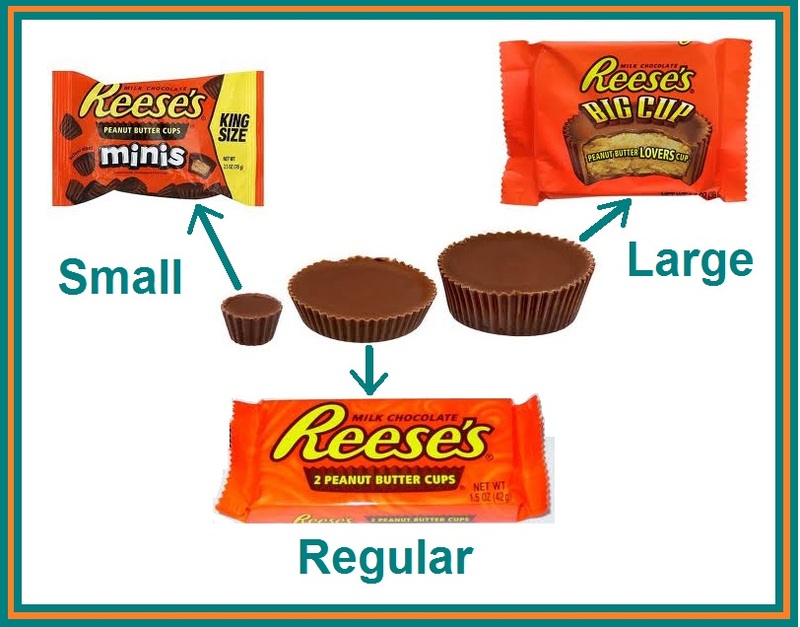 Hershey’s have over the years brought out a number of limited editions of their much adored PBCs, however their current core range consists of 3-sizes: mini, regular and the Big Cup, and lots of confectionery companies follow this format and release miniature and giant versions of candy favourites in addition to the normal sized options. The Hublet is a fan of allowing me to explore and taste the new things that America has to offer, and was happy for me to try the Reese’s PBC which, in hindsight, was an awful idea as I now have a terrible hunger for them. He educated me that Reese’s PBCs should always be stored in the freezer first to solidify the contents (which calls for a phenomenal amount of willpower) and ensure the perfect texture when eating, and in the sun, humidity and heat of Florida that’s actually a very smart idea. Interestingly enough, in the early 1900’s a man called Harry Burnett Reese successfully applied for a dairy farm job on a farm owned by the Hershey family of Hershey’s chocolate fame, and after Hershey’s closed down the farm he found a handful of other jobs but ultimately sought out employment again with Hershey’s, but this time not on a farm but within their chocolate factory. He caught the candy bug from them, and began working on his own candy creations out of his home basement in the hope of making a little extra money with which to support his 16 children (I’m not sure if they all shared the same Mother or not, but if I was the proud birther of 16 kids I would need either chocolate or alcohol to help me keep a smile on my face). He found success to the extent that he left Hershey’s and set up his own company in the 1920’s, called the H.B. Reese Candy Company. Although he started out selling a range of candy, during World War II he thinned down his line and focused on his most popular selling chocolate treat, his peanut butter cups. He went from strength to strength, expanding his chocolate empire and establishing the orange, yellow and brown wrapped treats as an American favourite. 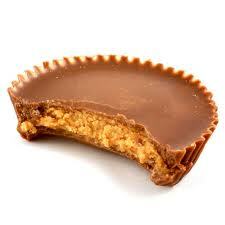 He died in 1956 of a heart attack, and in 1963 six of Reese’s sons sold the company to Hershey’s for $23.5 million. Hershey’s then took the already popular chocolate and turned it into the world dominating monster it is today, managing to keep it in the top 10 chocolate bars sold worldwide. I discovered that Williams-Sonoma, an American specialty retailer, recognised the financial potential of this American favourite treat and started to sell online an exclusive creation from Perfect Endings (a wedding and special occasion cake designer (and by that read ‘clever & expensive bakery’) in Napa Valley that came up with Perfect Ending Cupcakes which in 2007 were one of the favourite things of Her Imperial TV Highness Oprah) that they simply call a Peanut Butter Cup Cake. 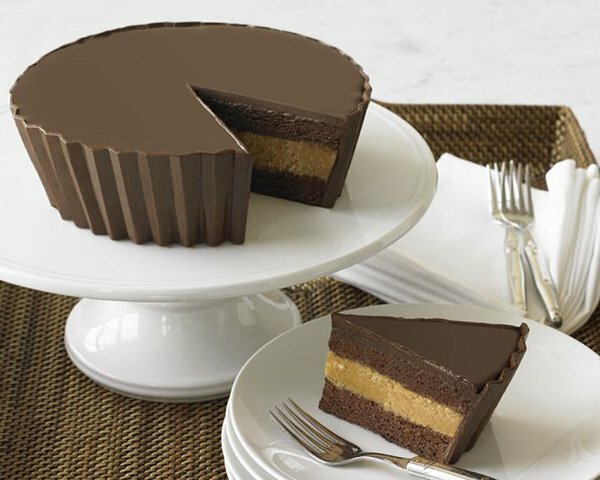 This work of art is not simply 1,000 Reese’s PBC melted into a cake, oh no my friends, this object of desire is made up of a peanut-butter filling sandwiched between two layers of chocolate cake, covered in a shell of dark confectioners chocolate molded to resemble the exterior of a Reese’s PBC, and is 2.25″ in height and 7.5″ in width, serving either 10 people in total or just yourself over 3-days. To explain away the $79.95 price tag, the cake is made of Belgian Chocolate, French artisan butter and dairy cream, and will be shipped out frozen to ensure it arrives with you in perfect condition, ready to thaw and devour. I know that I will never, never, never pay out $80 for a cake (although if any of you American’s are stuck looking for the perfect way to welcome me to the USA then now you have a clue…do I need to put this text in bold or did you get the hint? ), however I’m not above trying to make my own Reese’s Peanut Butter Cup inspired goodies, and have bookmarked this amazing Reese’s Peanut Butter Chocolate Cake, which is essentially a Cocoa Buttermilk Birthday Cake with Peanut Butter Frosting recipe from Tara Liptak at Smells Like Home, a really well put together and visually gorgeous recipe blog. So in conclusion, although I have my own firm opinion on the American chocolate that’s readily available, one of its surprising champions is actually made by the company I hold responsible for some of the foulest-tasting chocolate I’ve experienced. Talk about a shocking plot twist!